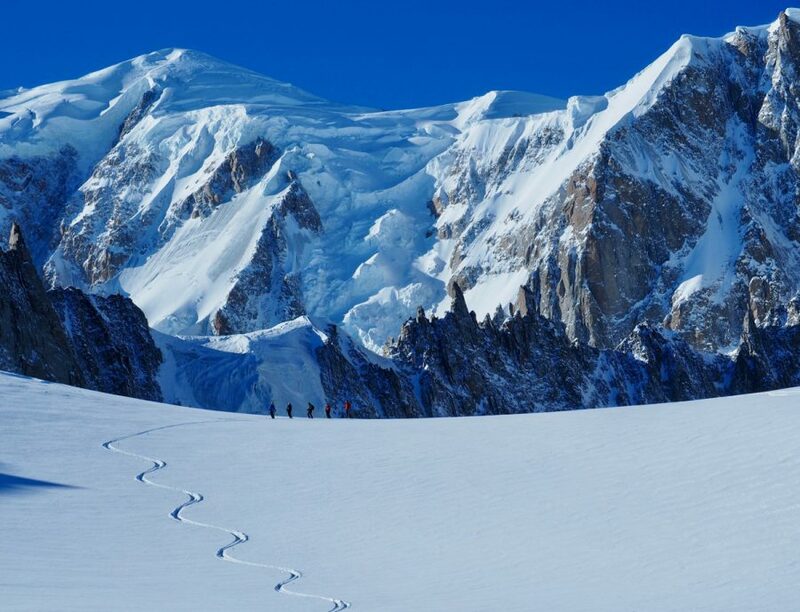 A cold, cloudy and snowy morning in the Chamonix Valley was soon replaced by brilliant blue skies on the Italian side of Mont Blanc and some nice ski touring in the upper Vallée Blanche. There was a pleasant shallow layer of fresh snow where the wind had not scoured the slopes near the cols and Italian – French border Ridgeline. A few teams were skinning around to the Col d’Entreves but it looked quite wind blown higher up. Likewise the Combes Vierge & Noire were full of old tracks but it looked like nicer snow in Combe Maudit, so, despite the easier angle, we headed up there for some pleasant turns before continuing down the normal route on the Vallee Blanche for more fresh tracks before skinning back to the Rifugio Torino. There were loads of tracks on the Gros Rognon and most other variations of the VB from the Midi side although very few skiers actually seen today! Work has now started on equipping the Midi snow ridge and there are some basic fixed ropes in place. Note that this is very different to the full Z track which goes in later in the season. Crampons and knowledge of how to use them effectively are still very much required. 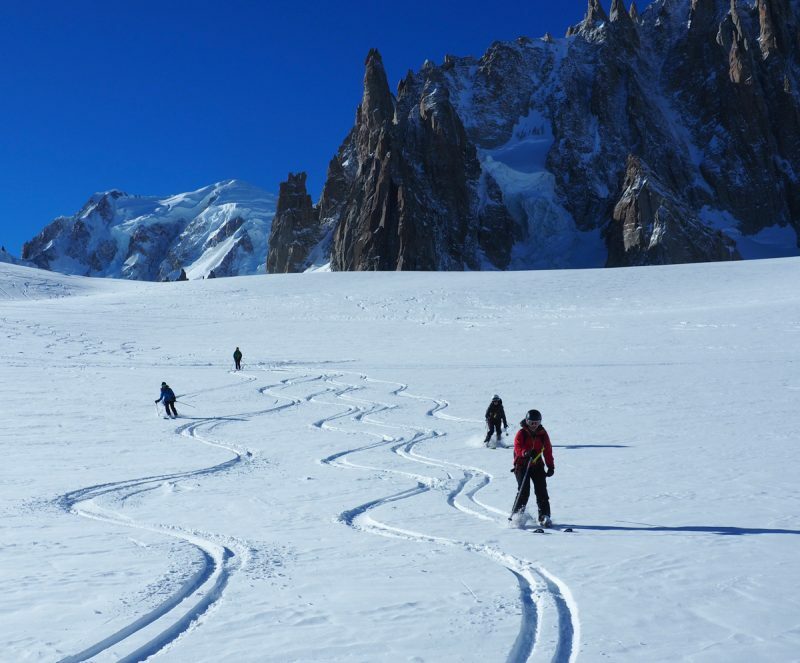 The lower glacier and James Bond track down to Chamonix are both reported as being pretty thin and rocky and probably worth avoiding via a train ride down! Skinning back over the Col Petit Flambeau and across to the Torino Hut. There were lots of old tracks on the steep couloirs around the Torino, Entreves and down on to the Toule Glacier, but more snow is required to make these fun again! Likewise pretty dry and poor conditions are reported at Courmayeur and even more so lower down Val d’Aosta. Happily both the snow volume and quality is better on the northern side of Mont Blanc and around Chamonix, Aiguilles Rouges, Aravis etc. It looks like there is quite a bit more on the way too on Sunday & Monday! We were skiing with our Chamonix Off Piste & Mountain Skills team today. The Jan & Feb courses are full but we have places on our March & April courses. 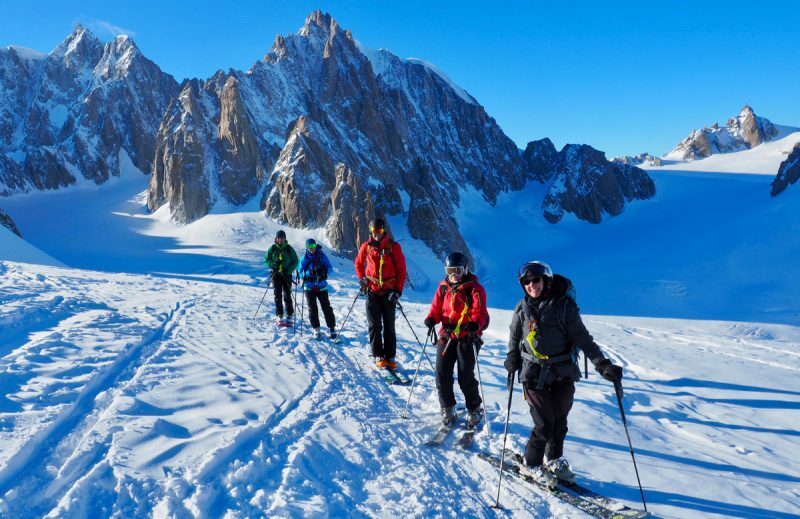 We also have places on our ski touring weekends in Feb and March and details of these and all our other skiing group courses can be found on our Chamonix Ski Courses page here.